I still remember hearing The Darkness for the first time 12 years ago. Their first, and best known single, “I Believe In A Thing Called Love” was all over the radio and the music video was a big deal at the time, too. Actually, I think that was the last time I saw a really cool music video on MTV. 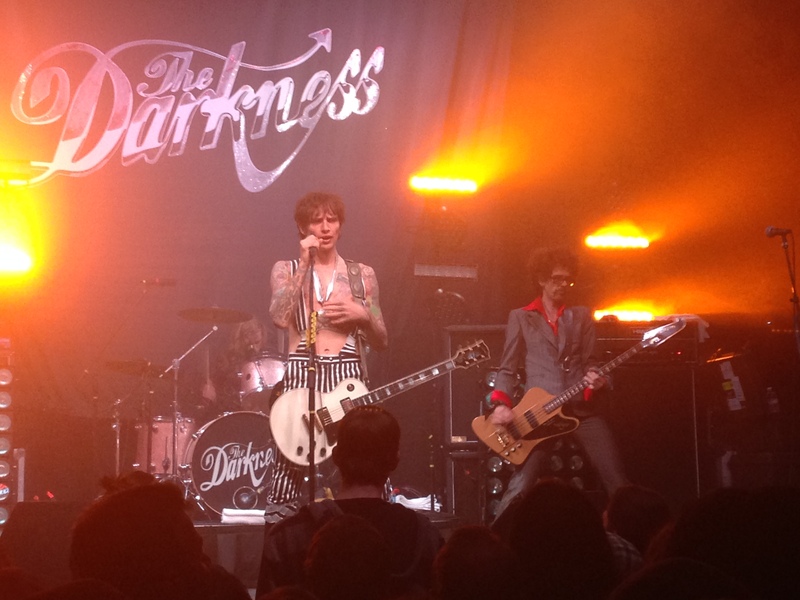 The Darkness belong to a bygone era of rock music, which is probably why I love them so much. An era of huge hooks and killer guitar riffs. I’ve been following the band’s career through lineup switches, break-ups, and changes in facial hair…and in 12 years they’ve never let me down. Maybe that’s why I wasn’t worried about the band delivering the goods live. 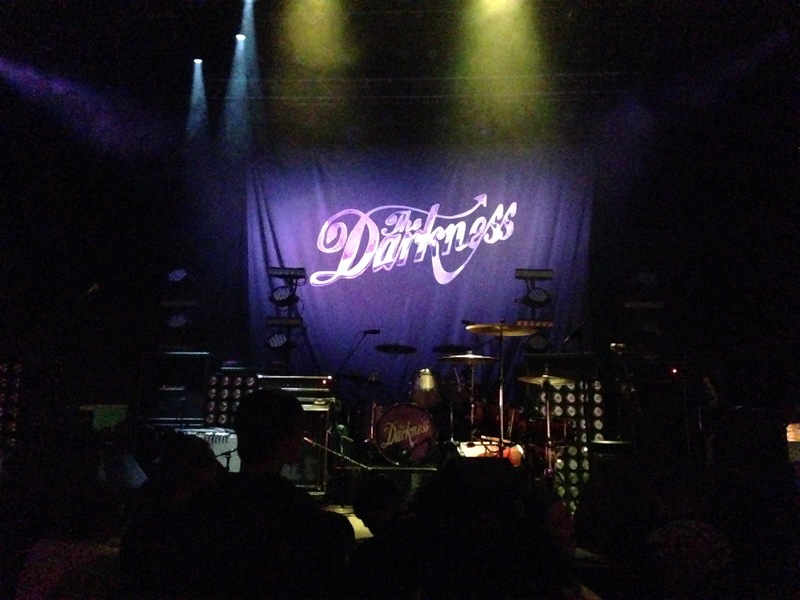 I’d read online that the band was great live, but I was still unprepared for just how good The Darkness are live. I got to the Summit Music Hall early, like I usually do, and my first impression was “Jesus, this place is small.” I realize that America is no longer a bastion of rock fans, but even I was shocked at what a tiny venue the band was playing. Overseas, The Darkness headline big music festivals and are a bit of rock royalty…here in my home State of Colorado they were just thin dudes in funny clothes playing a club show. I’m grateful that I got to see this band up-close and personal, but if there were any justice in the world we’d have been at the enormous Pepsi Center across town. My friend Dylan, also a huge Darkness fan, shared this sentiment upon seeing the size of the room the band was playing. Something weird happened to the opening band and a local band In The Whale filled-in. In The Whale was a noisy two-piece that reminded me of Death From Above 1979 with a dash of rockabilly. As is usually the case with two-piece bands, the sound they made was mostly noise. They had a couple of songs that weren’t awful, but at no point were my friends and I compelled to leave the bar area. When The Darkness hit the stage Dylan and I were ready to rock, primed with beer and free Strongbow (a sickeningly sweet-variant of hard cider). The band opened with “Barbarian” off their latest album LAST OF OUR KIND (you can read my review of that here). 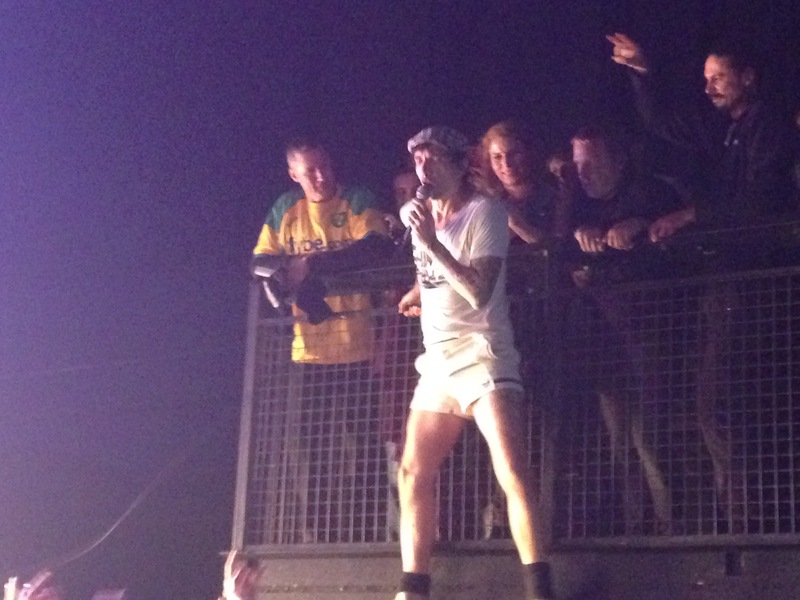 Front man Justin Hawkins strutted out onto the stage in a weird stripy catsuit-thingy. Shirtless and covered in tattoos, Hawkins had a Jagger-ish quality to his stage presence which kinda surprised me because I always mentally compare him to Freddie Mercury (for obvious reasons). Justin’s brother, lead guitarist Dan Hawkins, was downright normal by comparison with his mane of rocker curls and tight Thin Lizzy t-shirt. Bassist Frankie Poullain won hands down for most-interesting/I-can’t-stop-staring-at-you with his massive puff of frizzy hair, New Wave-ish business suit, and Hell’s Angels facial hair. Meanwhile the band’s current drummer, Rufus Tiger Taylor, did an adequate job but didn’t really stand out. Look at that hair, glorious! The band barreled though a set list of tracks skewing heavily towards the band’s first album PERMISSION TO LAND with key tracks from the other three albums sprinkled throughout. At the mid-point of the show, Justin invited a slightly middle age looking couple onto the stage because they were getting married the next day. Or so they claimed, I’m always skeptical of these kind of people. Justina and Co. got them comfy and then proceeded to serenade them with “Get Your Hands Off My Woman.” This was an amusing choice because, in case you aren’t aware, the song is peppered generously throughout with “motherfuckers.” I’m sure that glorious moment will be retold for decades to come by this happy couple, perhaps to coca-sipping grandchildren. Pretty much any Darkness song you’d want to hear the band played (though they did not play the one song I yearned to hear “Keep Me Hanging On” off the third album). Songs like the super-appropriate “Friday Night,” “One Way Ticket,” and “Love Is Only A Feeling” were all played with propulsive precision. Sometimes seeing your favorite band play your favorite tracks live is a bit underwhelming, but The Darkness’ charm and musicianship were high and at no time did I find myself thinking this is cool and all, but it sounded much better on the album. A roadie was constantly shuffling on stage to bring Justin a Gibson guitar, only to return once his guitar bit of the song was over so he could bop across the stage unencumbered. The spastic lead singer actually sat down for two songs to play keyboard, which I wasn’t expecting. Yes, the band played “I Believe In A Thing Called Love” and they didn’t save it for the encore, like I was expecting. I’ve heard this song more times than I can count, and to be honest, I would have been 100% fine not hearing it live. But it was rad hearing it live and feeling the crowd’s energy during this classic number. Usually when I leave a really good concert, I find myself in love with a song that I wasn’t as big a fan of prior to hearing it live. To this day, I absolutely love “Tumbling Dice” by the Rolling Stones, a song I had no real feelings for prior to witnessing the band play live on The Bigger Bang tour a decade ago. Well that Darkness song is “Love On The Rocks With No Ice,” which popped up during the encore. I am still catching myself humming this tune two days later! 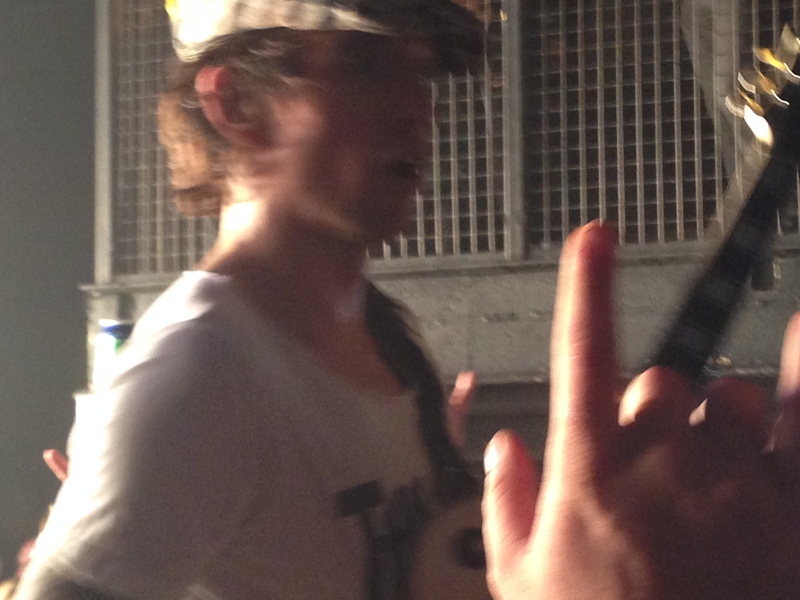 Also worth mentioning: the band played one NEW song about 2/3’s of the way through the show. It was a great song, though I didn’t catch the name of it at the time (ringing ears and all). A quick check online reveals this song to be titled “Rack of Glam.” If this track is any indication of what might be on the next album, then I think we have another great album on the horizon. Though there wasn’t as much stage banter as I’d have thought, there were a couple of great moments (besides dragging the couple on stage). The audience was really into crowd surfing, and near the end of the show, Justin surfed out into the audience and climbed up onto the balcony. Watching Justin dive back into the crowd mere feet away was definitely my top rock moment of 2015. Up close and slightly personal. Bottom line: I’d see them again, right now if I could. It’s rare these days to see a band that’s able to be both awesome sounding and off-the-wall fun live. 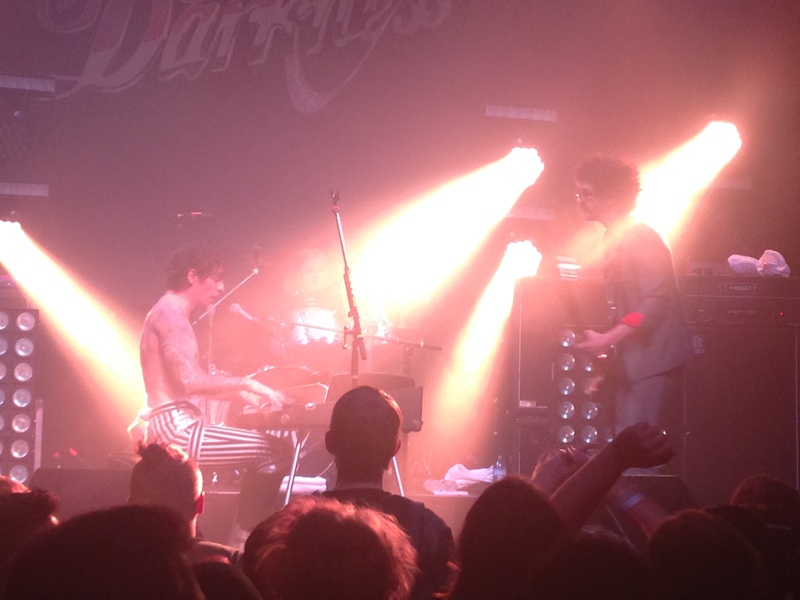 The Darkness put on one hell of a show…truly they are the last of their kind. Their show a few days ago in Seattle was the best I’ve seen since Van Halen’s Fair Warning tour in 1981. You’re spot-on about “I Believe in a Thing Called Love.” Like you, I’m pretty much done with that tune (despite how good it is) but they performed it SO well that I have to acknowledge that the song was one of the highlights for me. It’s funny that mention Van Halen because when I was at the show I kept thinking: “my God, this must have been what it was like in the ’80s.” I’m glad I got to experience a little of that, even if it is just a throwback. It was reminiscent of an early 80’s rock show, for sure. I find it somewhat remarkable that The Darkness, despite their goofier tendencies never give their fans that knowing wink to indicate that they’re “in on the joke.” I think that’s because they know, as do you and I, that their music and performance is no joke, even if its written and played with a fair dose of humor. They’re playing it completely straight and in the style of heroes from a less cynical time. How rare is that these days? In 1981, though, that was the norm. Shows from “Back in Black” era AC/DC, “Moving Pictures” era Rush, and “Fair Warning” era Van Halen featured bands who were, even at the time, iconic. As a fan at their concerts, the electricity in the arena made you feel like you were witnessing and participating in something that approached apotheosis–the bands felt superhuman; rock gods, indeed. That’s pretty much gone, now, though. In an era of fragmentation, it might be impossible for a modern band to connect with enough people to create the critical mass required for them to ascend to that level. But The Darkness come pretty danged close to getting me back to that place. 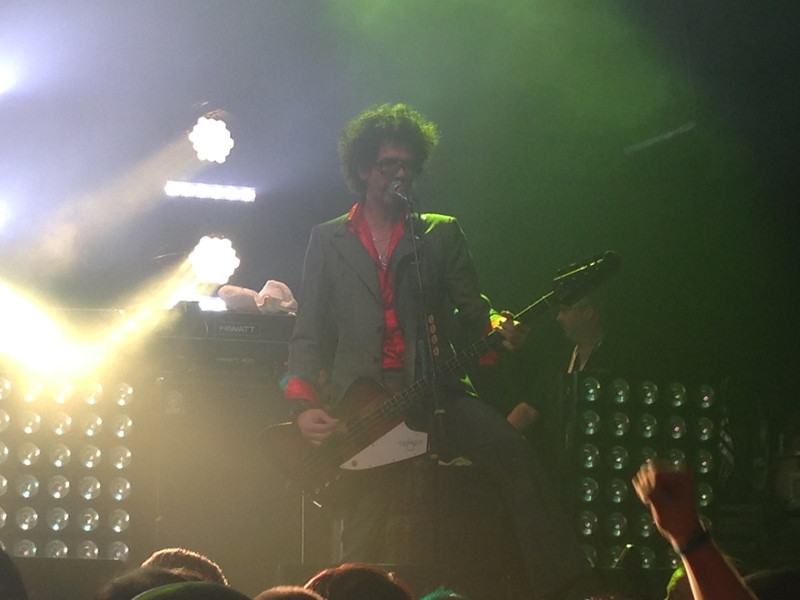 I LOVE watching Dan Hawkins play guitar, for example. His School of Rock Power Stance only bolsters his already fantastic guitar work (he is, as far as I’m concerned, the heir to the rhythm guitar throne established by Chuck Berry and later occupied by Keith Richards and Angus Young). The fact that he does it in front of a Marshall Stack only adds to the imagery. Frankie Poullain looks absolutely ridiculous and, as far as I can tell, that’s the point. So did every other pre-1990 rock star. During the show, that ridiculousness sets him apart from and, maybe, above the rest of us. Compare that to the 1981 Fair Warning tour I referred to in my prior post. Consider Van Halen’s wardrobe choices, primarily dicated by David Lee Roth who insisted that the music should “look like it sounds.” Edward and Alex Van Halen each wore knickers with striped socks and matching striped shirts (Eddie in red, Alex in black). Michael Anthony danced around the stage in a flight jumpsuit (and occasionally a matching helmet). David Lee Roth had a couple of different styles of low-rise spandex football pants. The band, especially in retrospect, looked downright silly. A few biographies later, we know they *knew* they looked silly. But being “over the top” was part of the rock god persona. It wasn’t just about wardrobe, though. How they played, how they interacted with the audience, and how their shows were staged all supported the persona. Van Halen and the bands of the time embraced the persona without cynicism. U2’s the last band, that I can think of, from that mold. I think they went out of their way to elevate and then cynically bury that persona with their ZooTV tours. Those tours, combined with the rise of 90’s Alternative music, which was more about the anti-rock-star, effectively ended the era of BIG rock music. It’s no wonder that so many initially viewed The Darkness as a novelty, perhaps ignoring the remarkable quality of the music they were producing (just like the equally retro Jellyfish 15 years earlier, I might add). 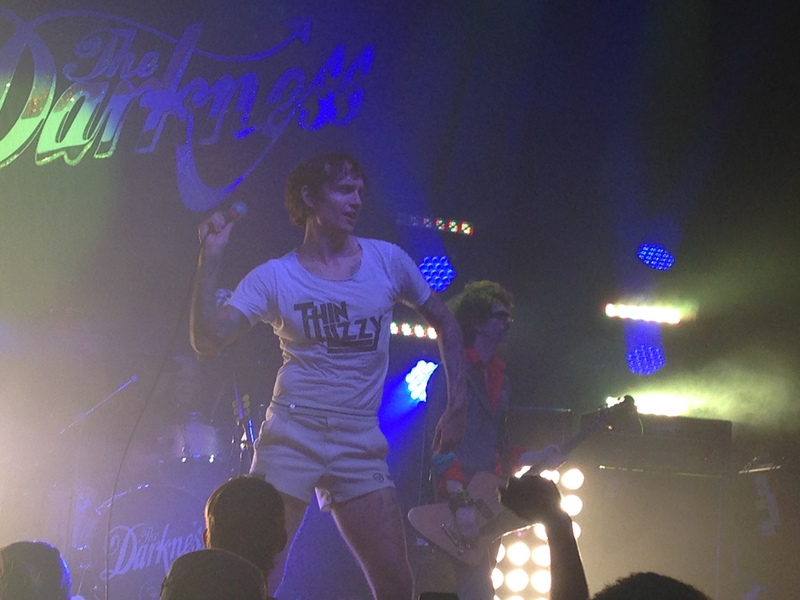 The Darkness are a band of irreverant characters that writes and performs excellent music in an over-the-top fashion. Comparisons to the big bands of the 70’s and 80’s are inescapable as that’s the last time any of us have regularly witnessed that type of musical production. I, for one, couldn’t be happier about it and I’m glad you got a chance to experience it a little.